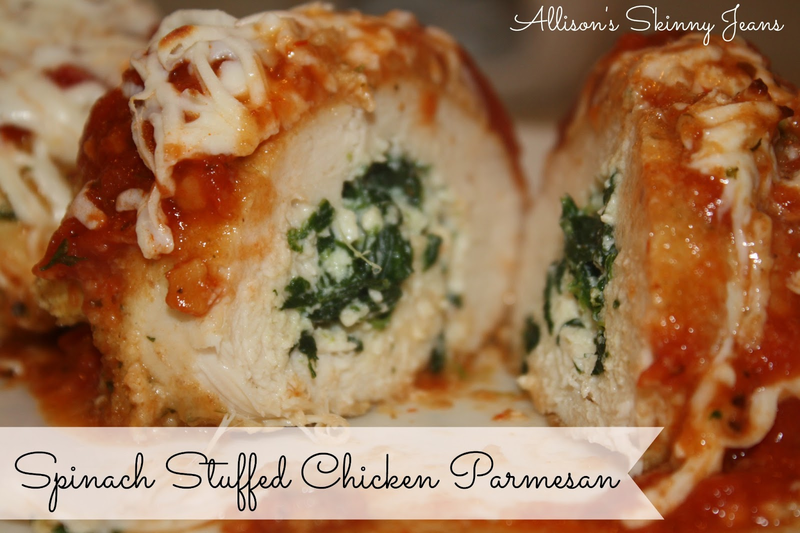 Looking for a lighter alternative to chicken parmesan? Look no further! My husband says this is his new favorite dinner! I found the recipe over at Gina's Skinny Recipes. I made a pan of them for my husband and I to eat on. They are also great for a dinner party! 1. Preheat the oven to 450. Season the cutlets with salt and pepper to taste. (I cut chicken breasts in half and beat them out thin with a meat tenderizer). Spray an 8x10 baking dish with non-stick spray. 2. Combine breadcrumbs and 2 tbsp grated parmesan in one bowl and 1/4 cup egg beaters in another. 3. Combine 1.5 oz mozzarella cheese, remaining parmesan cheese, spinach (defrost in microwaves and squeeze dry in a colander), 2 tbsp egg beaters, and ricotta cheese. 4. Spread 2 tbsp of the spinach mix on each chicken cutlet. Loosely roll them up - keep the seam toward the bottom. 5. Dip the chicken in the egg mixture and then coat with the breadcrumb mixture. Place them in the baking dish with the seam towards the bottom. When all the chicken is in the dish, spray lightly with olive oil spray. 6. Bake for 25 minutes. Take out of the oven and top with the marinara and remaining mozzarella cheese. Bake until the cheese is melted (about 3 minutes). I served mine with salad. You could also cook noodles to go with them. Those look so good! I haven't had chicken parmesan in forever. I'm going to have to try this. I really like the idea of spinach inside. I think my son would even eat these!! He asks for chicken parm all the time and orders it out all the time. He actually will eat something with cookied spinach in it....these are a win win for me. Thanks for the recipe! Visiting from Tuesday Trivia! Mmmm, looks delicious! Were big spinach lovers in this house and the boyfriend loves Chicken Parm! Thanks for the recipe. I'm visiting from A Glimpse Insides party! I just tried this recipe last night and it was a big hit! Thanks so much! Thanks guys! My husband doesn't love spinach, but he loved this. He told me it is his favorite dish now. Kate, I'm so glad you liked it!